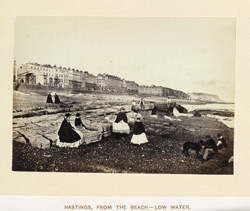 This beautiful and atmospheric view by Francis Frith (1822-1898) of women dressed in cloaks and crinolines and boys seated on a rocky ledge on the beach at Hastings, East Sussex, is one of sixteen photographs illustrating his book ‘The Gossiping Photographer at Hastings’, published in 1864. Frith was a pioneer in the field of travel photography, beginning his career with three trips to Egypt and the Holy Land between 1856 and 1860. In 1859 he founded his own publishing firm in Reigate, Surrey, which issued albums and postcards of views throughout Britain. These sold to an eager tourist market and the firm became the largest of its kind in the 19th century, continuing to be run as a family business until 1971. In his first album, ‘Egypt and Palestine Photographed and Described’, Frith also wrote the letterpress commentaries that accompanied his photographs. ‘The Gossiping Photographer at Hastings’ continues this dual authorship and its text is notable for the gently satirical attitude which he adopts towards the 19th-century English seaside resort and its visitors.